As was the case at the Olympics, a refugee team has been formed in order to draw the world’s attention to the plight of people around the world who feel the need to risk their lives to escape persecution. Syrian-born swimmer Ibrahim Al Hussein and Iranian discus thrower Shahrad Nasajpour will compete at this summer’s Paralympics. As a young boy Al Hussein had a dream of becoming an Olympic swimmer, drawing inspiration from his father who was a swimming coach. However, those dreams were rocked by the war in Syria and, in 2012, disaster struck for Al Hussein. Having already taken shelter inside his house from a bomb blast, Al Hussein heard his friend crying for help. As he ran outside to assist his trapped friend, he was hit in the leg by a rocket, which resulted in his leg having to be amputated. The amputation did not run at all smoothly due to Syria’s depleted medical supplies and Al Hussein woke up twice during the surgery, seeing everything. Following his amputation, Al Hussein fled Syria to the Greek island of Samos on a dinghy in order to have further treatment on his leg and he eventually managed to receive a prosthetic limb from a private doctor. Al Hussein was granted asylum by Greece in 2014 and went on to join a disabled athletes club, starting the journey he will complete by competing in the 50m and 100m freestyle swimming events at Rio 2016. 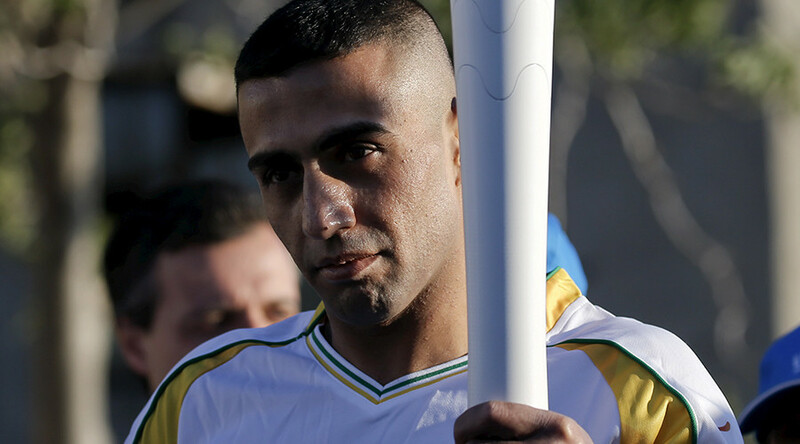 He was given the honor of carrying the Olympic torch in the build-up to the game and paraded it with pride through the Elaionas camp in Athens, which houses 1,500 refugees. His teammate, Shahrad Nasajpour, is a discus thrower from Iran now based in the United States. She suffers from cerebral palsy and will compete in the F37 discus event in Rio. Whilst many will sympathize with these type of cases, it is worth noting that Al Hussein’s times in the pool are only a couple of seconds off from the personal bests he set when he had both of his legs. These refugees are not at the Olympics to simply be an exhibit, but to compete at the highest level. In the event of either athlete winning a medal, the Olympic anthem will be played to greet their extraordinary success.